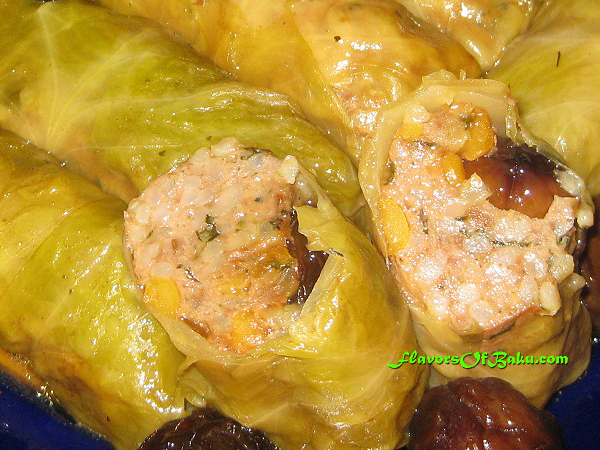 KELEM DOLMASI (stuffed cabbage leaves) is as popular in Baku as is Badimjan Dolamsi (stuffed eggplant, tomato, and bell pepper) and Yarpag Dolmasi (stuffed grape leaves). 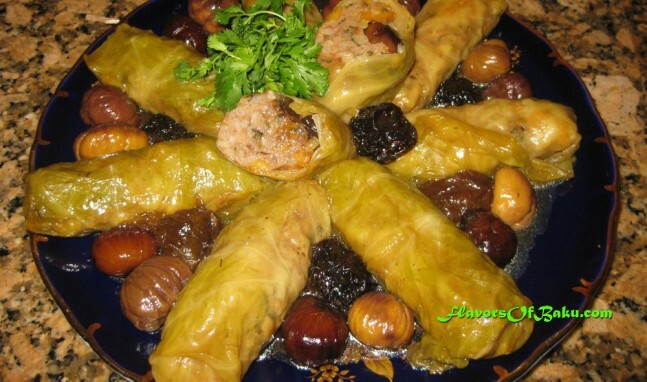 There are two types of Kelem Dolmasi in Azerbaijani cuisine–Turshi Kelem Dolmasi Azerbaijani-style (cooked with split chickpeas, chestnuts and dried sour plums) and Baku-style Kelem Dolmasi (cooked with tomato sauce). 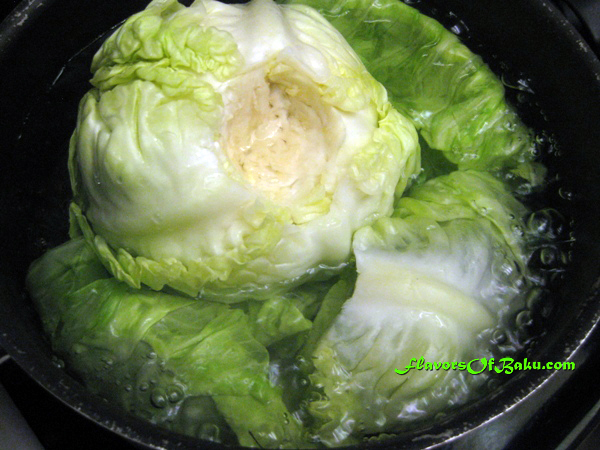 The leaves of the cabbage need to be softened so that they are soft enough to be pulled off of the head and rolled up with stuffing. 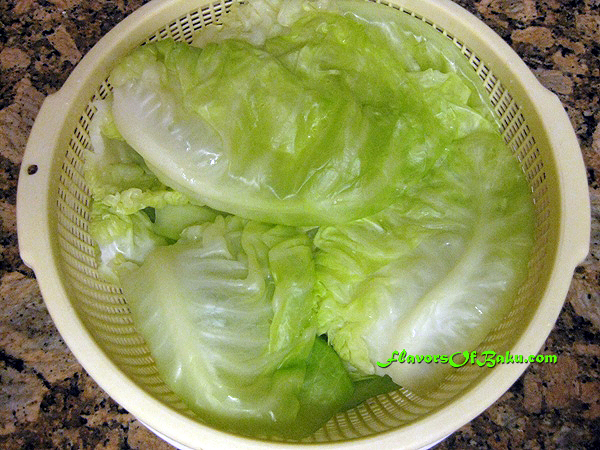 Place the softened leaves in a colander to drain. Repeat until all of the useable leaves are free. 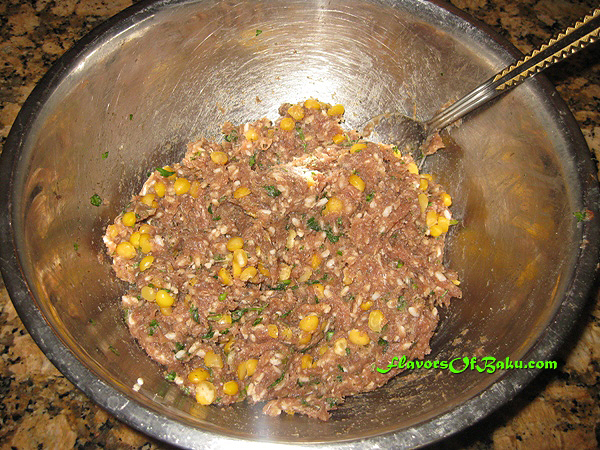 In a large bowl, mix the following together: ground meat, finely chopped (or ground onion), washed rice, pre-cooked split chickpeas, washed and chopped fresh herbs, and salt and pepper. When the leaves are cool enough to handle, use a knife to remove as much as the tough stem from each leaf as you can without cutting through the leaf itself. If the leaves are very large, cut them in half. Lay out a single leaf on a plate or working surface. 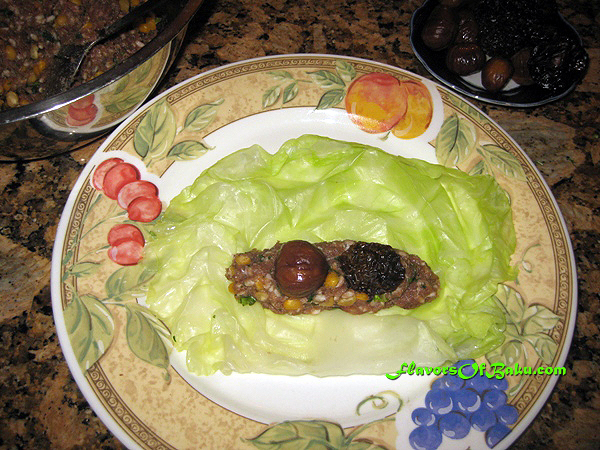 Put the meat filling (about 1½ tablespoons) on it, then place one pre-cooked chestnut and one washed dried plum on top of the filling. Fold the ends of the leaf over the filling, and roll tightly. 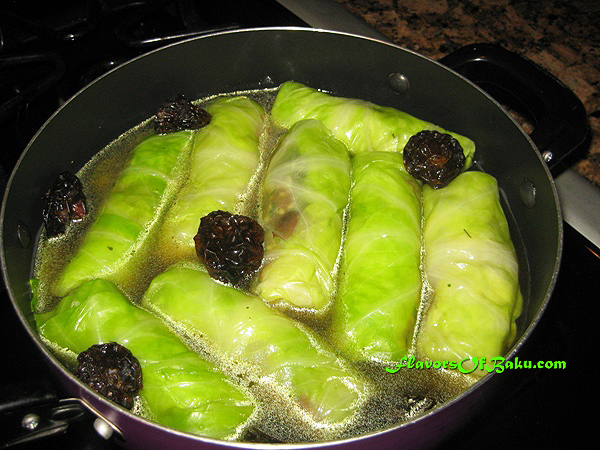 Cover the bottom of a saucepan with a layer unused leaves, and then place each folded dolma as close as possible to each other. Somewhere, randomly, in between dolma place the washed dried plums and chestnuts. 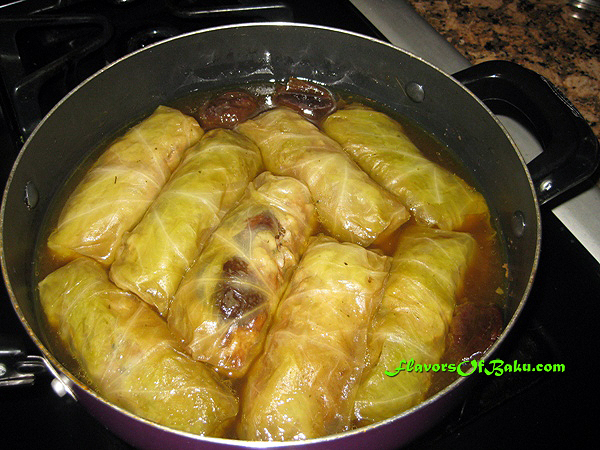 Place a suitable inverted plate on top to prevent dolma from unfolding while they cook. Allow the beef stock to come to a boil over medium heat, then, turn the heat down, cover the saucepan with a lid, and simmer for about 1 hour over low heat or until the cabbage leaves are tender and the filling is cooked. Serve the kelem dolmasi as a main dish, while hot, with the sour bouillon it was cooked in or a mixture of plain yogurt and crushed garlic.